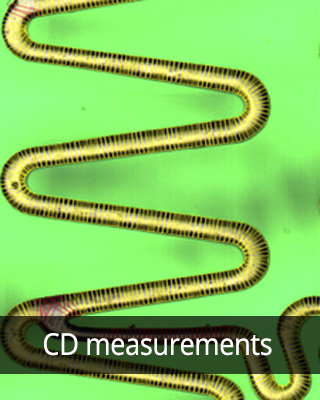 The hardware and software of the Q six system have been designed to perfectly accommodate a stent’s cylindrical geometry. 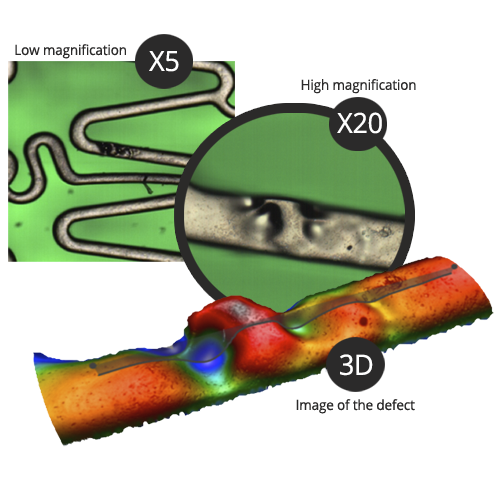 Offering a combination of automatic dimensional measurement and assisted visual inspection, and with the addition of 3D capabilities for surface roughness assessment and defect analysis, Q six is the perfect tool for inspection during R&D, development and production phases of coronary stents. 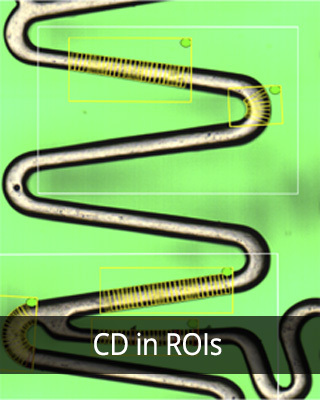 The throughput of Q six for standard coronary stents (1.5 mm OD and 20 mm length) is approximately 1 stent/minute, comprising dimensional analysis and visual inspection for the outer surface. 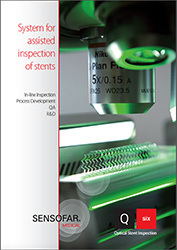 Q six can acquire high-quality unrolled images of the stent surface. 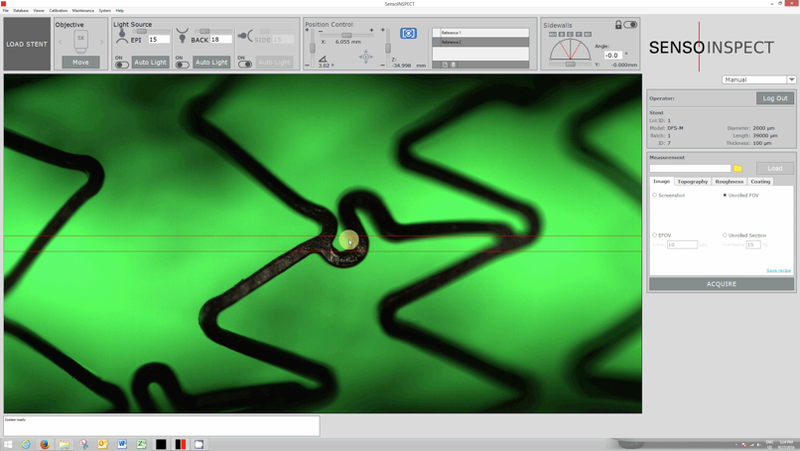 With simultaneous acquisition and analysis capability, Q six processes images as they become available, measuring strut width (for the full stent or only for selected ROIs) and automatically inspecting the stent for defects, detecting and classifying these in line with user-defined categories. 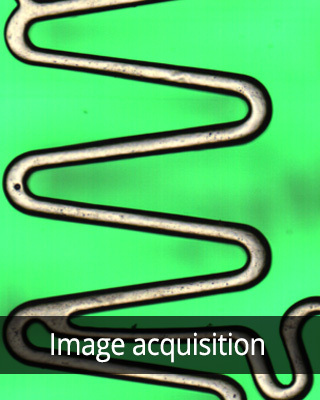 As well as high-resolution stent imaging, Q six can alsoperfrom 3D measurements. Q six’s multiple objectives featuring different magnifications, some of them compatible with 3D acquisition. This gives the operator the versatility to perform detailed measurements of the defects found and to additionally inspect them at higher magnification. 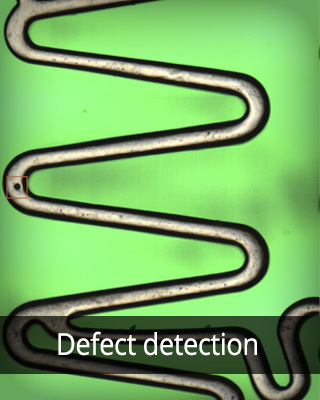 For the operator, rapid assessment of defect geometry is possible, thus avoiding false positive detection and reducing the rejection rate in production. 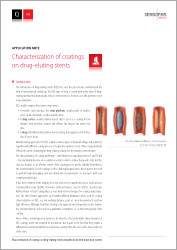 Drug-eluting stents are a particular type of stents that are provided with a thin drug-eluting membrane. 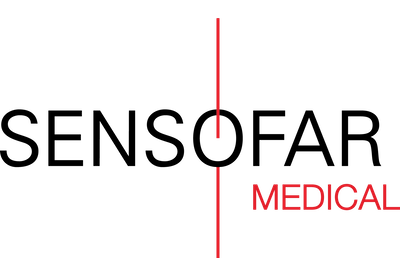 The drugs utilized are designed to prevent tissue damage or even the rejection of the device following the intervention. The introduction of such devices to the market brought new challenges for their inspection for Quality Control – this coating must have a specific thickness and high uniformity for best performance. Performing a coating measurement only requires selection of one of the available objectives with 3D capability in the software, followed by selection of the measurement type and the ROI for the measurement. In a matter of seconds, the 3D result and thickness average, max., min and std.dev calculations are displayed, and the user is also presented with the option of viewing a profile of the coating thickness for the ROI.